According France's national red list, Papilio phorbanta is a threatened species in France. Endemic to Reunion Island, Papilio phorbanta is one of the largest butterflies found on the island today. In this species, males and females have distinct behaviour and morphology. 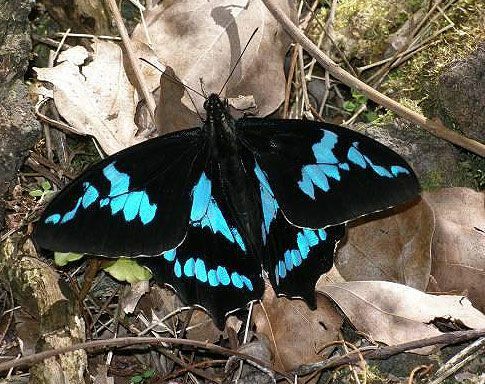 Black with intense metallic blue patches, the males fly around the entire island, including urban areas and high altitudes, seeking food and sexual partners. More sedentary and discrete, with brown wings bordered with yellow patches, the females are rarely visible and can be easily confused with another species, Danaïde Euploea goudotii. The green caterpillars mainly feed on English climber, an indigenous plant from the Rutaceae family, but can also be found on citrus plants and other cultivated species of Rutaceae. Only in a few untouched sites at low altitudes, where the main host plant of the caterpillargrows, can several butterflies be observed at the same time. These sites are therefore probably the insect's major mating areas. Over the past twenty years, the number of individuals observed on these sites, as well as elsewhere, has gradually and significantly decreased without the causes of this disappearance being exactly understood. Under regional protection since 1989 and national protection since 1993, Papilio phorbanta is "endangered” on Reunion Island. Red List of threatened species in France - first chapters dedicated to the fauna of Reunion Island.